(Nanowerk News) In the quest for abundant, renewable alternatives to fossil fuels, scientists have sought to harvest the sun’s energy through “water splitting,” an artificial photosynthesis technique that uses sunlight to generate hydrogen fuel from water. But water-splitting devices have yet to live up to their potential because there still isn’t a design for materials with the right mix of optical, electronic, and chemical properties needed for them to work efficiently. Now researchers at the U.S. Department of Energy’s Lawrence Berkeley National Laboratory (Berkeley Lab) and the Joint Center for Artificial Photosynthesis (JCAP), a DOE Energy Innovation Hub, have come up with a new recipe for renewable fuels that could bypass the limitations in current materials: an artificial photosynthesis device called a “hybrid photoelectrochemical and voltaic (HPEV) cell” that turns sunlight and water into not just one, but two types of energy – hydrogen fuel and electricity. 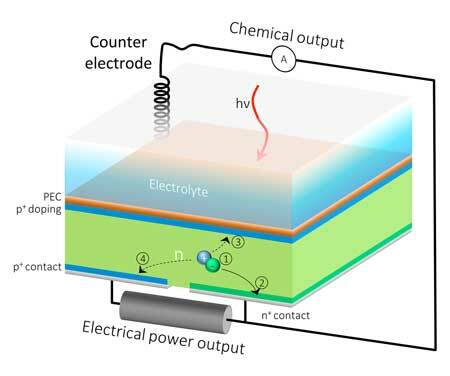 The paper describing this work was published in Nature Materials ("Hybrid photoelectrochemical and photovoltaic cells for simultaneous production of chemical fuels and electrical power"). In contrast, the HPEV cells harvest leftover electrons that do not contribute to fuel generation. These residual electrons are instead used to generate electrical power, resulting in a dramatic increase in the overall solar energy conversion efficiency, said Segev. For example, according to the same calculations, the same 6.8 percent of the solar energy can be stored as hydrogen fuel in an HPEV cell made of bismuth vanadate and silicon, and another 13.4 percent of the solar energy can be converted to electricity. This enables a combined efficiency of 20.2 percent, three times better than conventional solar hydrogen cells.